I created my first PowerApp! It's a Conference Badge Scanner! I love attending conferences. They are a rare opportunity to meet the faces behind the emails and voices and spend time with friends that you only get to see once or twice a year. At the GPUG Summit 2018 conference in Phoenix last month, I had a great time, but there was one thing that I noticed was really frustrating me. 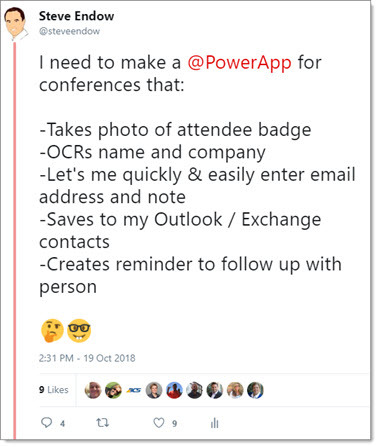 After a session, attendees would have questions or need assistance with a Dynamics GP issue, and I would promise to email them some information. Sometimes I would hand them one of my business cards, sometimes they would hand me theirs. If we had a pen handy, one of us would scribble something on the card to remind us what we talked about and prompt a follow up email. Unfortunately, I have plenty of evidence that this process just doesn't work well. Everyone is running around to different sessions at the conference, there are tons of distractions, we run out of business cards, the cards get stuffed into a backpack, and by the time we get home from the conference, exhausted, the last thing we want to do is sift through a pile of business cards with cryptic notes on them and try to remember what we were supposed to do, who we were supposed to contact, and which conversation went with which business card. I had never used PowerApps and had never created a PowerApp before, so I didn't know if this was possible, and if it was possible, how difficult it would be. Turns out, it is definitely possible. And although it was a little more challenging than I thought, now that I've done it, relative to other things I've done, it's not that difficult. And considering what the app can do, it's amazing how easy it is to build. 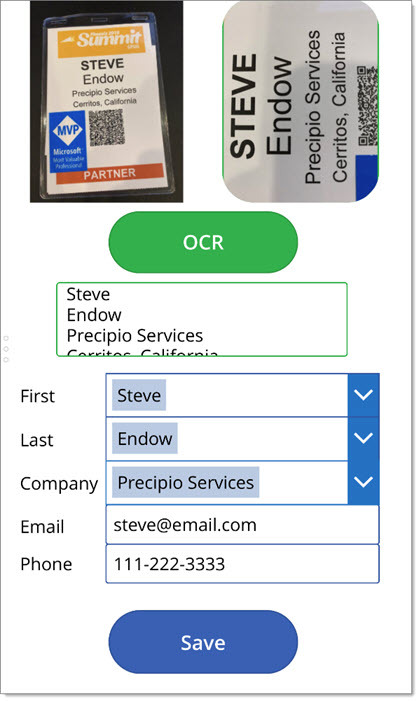 And here it is--my very own PowerApps Conference Badge Scanner! In the upper left is the live view of the cell phone camera. 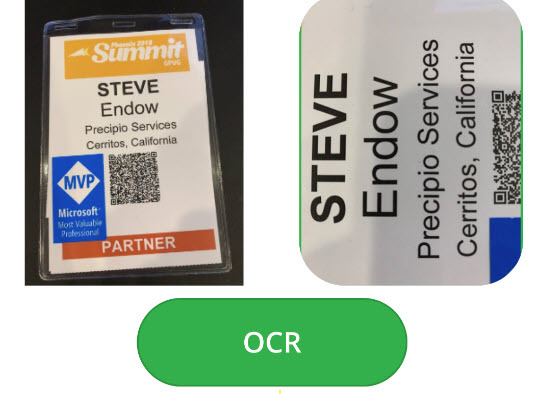 When the app is open on my phone, I can take a photo of a conference attendee's badge. In the upper right is a photo of the badge. Because conference badges can have lots of other noisy text besides the attendee name, I found that it is best if I take a photo of just the text that I want scanned. The phone rings and you answer the call. The caller is a manager from a medium sized business who uses the Microsoft Dynamics GP ERP system. He explains that his company has a new contract with a distributor, and they need to have their product shipped by a 3PL warehouse. That's the good news. The challenge is that the 3PL warehouse needs to send the company shipment information. Items shipped, quantities shipped, and shipment tracking numbers. The company needs to update their orders in Dynamics GP so that they can generate invoices. The 3PL uses a SaaS service that can provide this shipment information, but that SaaS service can only call a web service. And this small business doesn't have a web service. Or internal developers. Or an internal IT staff. What can we do to help this company? Do we try to help them used the outdated and problematic native Dynamics GP Web Services, and see if we run into problems with authentication, SOAP, limited endpoints, and fixed functionality? Risky, with an uncertain outcome, and difficult to estimate the effort and cost. Do we propose that they develop a custom modern web service that will be highly flexible and fast? We can create a pretty accurate estimate of the effort for this project, but it is expensive for the customer, feels like overkill for a single endpoint, and will require a developer to maintain the code going forward. Do we consider something like Azure Functions, which eliminates the need for infrastructure and developing a full web service, but still requires a developer? Can Microsoft Flow address the challenge of building a custom, modern, web service that will allow the customer to receive the shipment data from the 3PL's SaaS service?